Welcome to Intramural Sports! 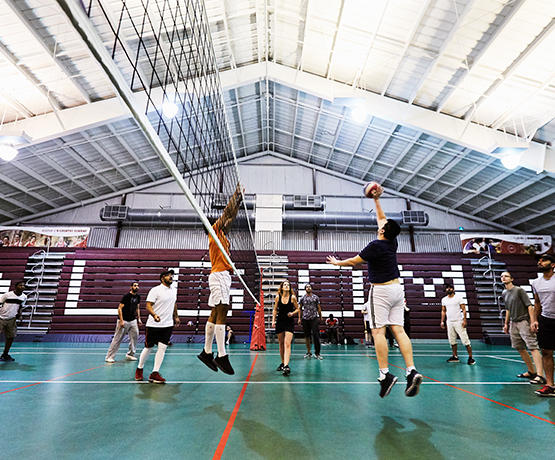 If you’re not into competitive varsity sports, you can still stay in shape and have fun by taking part in intramurals both on and off campus. Healthy bodies are linked to healthy minds and regular participation in intramurals is a great way to improve your fitness. Don’t have prior experience playing any of these sports? Don’t worry! Our intramural program accepts students of all different skill levels, and will provide training and coaching to get you to an experienced level of play. And if you don’t find the intramural you’re looking for, we can help you start your own. To register for intramural league play, choose from one of the following sports and fill out the form. Where available, there is also current information on teams, schedules, and standings. Volleyball league play starts on Tuesday, January 22nd and runs every Tuesday night from 8 to 11 pm. Pickleball is a fun paddle sport created for all ages and skill levels. The rules are simple and the game is easy for beginners to learn, but can develop into a quick, fast-paced, competitive game for experienced players. It combines many elements of tennis, badminton, and ping pong, and is played indoors on a badminton-sized court and a slightly modified tennis net. The game is played with a wooden paddle and a plastic ball with holes. Pickle ball can be played as doubles or as singles. Intramural Soccer starts on Thursday, January 24th and runs every Thursday night from 8 to 11 pm. Cord Basketball league play starts on Thursday, January 24th and runs every Thursday night from 8 to 11 pm.